"Do you remember the story about Icarus and how he flew too close to the sun? Icarus dares to fly with wings his father builds from feathers and beeswax. But the sun melts his wings and he falls from the sky. That’s the story of Icarus, but it’s only half the story. In this “fractured” retelling of the famous Greek myth, Icarus has a twin sister named Iris, and her dream is to fly. Rainbow Wings is the humorous, quirky story of one girl -- make that Greek goddess -- who dares to go where no girl has gone before! 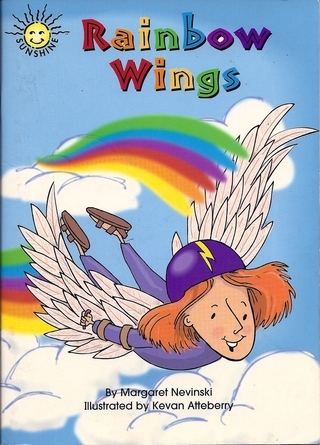 Rainbow Wings (Wright Group/McGraw-Hill), in its fourth printing, is read by kids in classrooms (Grades 2-5) across the country. It’s a great read-aloud and features zany illustrations by Kevan Atteberry. Visit Kevan at www.oddisgood.com. Iris stood by while Father built Icarus a pair of wings made of feathers and beeswax. “Please,” she begged. “Make me a pair, too.” But her parents smiled. Mother patted her shoulder. “We’ll make cookies for Icarus,” she said. More than anything, Iris dreamed about flying beyond the clouds to the sun. Every day after supper she crouched behind the workbench as Father formed the wings that would take her brother soaring. I was inspired to write Rainbow Wings by asking myself the question, “What if?” What if Icarus has a sister named Iris? What if her dream is to fly? What if -- where Icarus fails -- Iris finds a way to make her dream come true? After that, it was up to Iris to invent a top-secret, very sticky solution.